and get access to all the Writing Team's lesson sets! About The Rotation.org "Writing Team"
In addition to the thousands of publicly available lessons, ideas, and lesson sets contributed by volunteers, for many years we've had a group of writers working together to produce exceptionally creative and details lesson sets. We call them "The Writing Team." From 2004 to 2013, a group of volunteer writers here at Rotation.org produced over 200 Rotation-style creative lessons. When those lessons became accessible to only our Supporting Members, the Board decided they needed to be improved. Thus, from 2015-2018, every set was rewritten by a team led by Neil MacQueen, our paid Lead Writer, and a Luanne Payne our volunteer editor-extraordinaire. Their goal was to achieve a higher standard of creativity and detail, add more age-appropriate adjustments, and incorporate new teaching techniques and tips. See the Writing Team lesson menu. And now here in 2019, an improved approach to The Writing Team has begun, and the Team will be creating new lesson sets for Bible stories which the previous Team's hadn't covered. This new Team approach features more collaborative brainstorming and training of new volunteer writers by our Lead Writer, Neil MacQueen. Access to all the Team's super-creative lessons, plus all the great ideas in our free public forums are yours for the cost of a Supporting Membership ($45). Become a Supporting Member now. 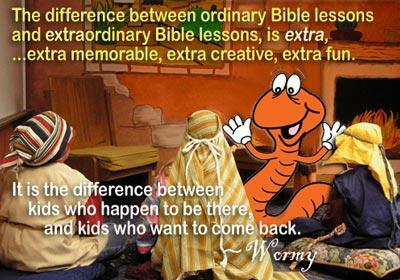 WT lesson plans are not "quickie story and craft" lessons for little kids. WT lesson plans feature real art, do-able drama, learning games, use of new media and new techniques, and being choosy about the videos we use. Each set includes lessons that explore new techniques. And each lesson has a level of detail, options, how-to, and "why-to" heretofore unseen in any curriculum. Each WT lesson set includes 6 to 7 different workshop-style lessons to choose from (art, drama, video, music, games, cooking, computer, etc), plus a teacher-friendly Bible Background and lesson summaries. The WT's target audience is the 2nd-5th grade, and each lesson comes with younger children adaptations. This follows a long-held Rotation point of view that it's easier to adapt a lesson "down" to younger kids than it is to figure out how to take a little kid's lesson and adapt it "up" for older kids. 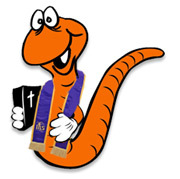 Many of the WT's lessons are easily adaptable to younger youth and special family event programs. While the lessons are primarily designed for Rotation-style workshop classrooms, those of our members using the traditional model (new story each week) also find our "WT" sets a great source of inspiration. The WT is working through a list of "major" Bible stories to create its special sets. Eventually, every major story will have a set by the WT, in addition to the PUBLIC lesson ideas and lesson plans others have contributed. Want to see what a Writing Team lesson set looks like? The team is always open to new folks with a knack for creative teaching, and who want to expand their creative pallet and learn how to write better lessons. You do not have to be an experienced writer. Email webmaster.rotation@gmail.com and we'll contact you. Back in 2015, we decided it was time to take the original volunteer team's work to a new level. After hiring a professional Rotation-style lesson writer to work with us, we spent the next three years upgrading or replacing the original team's work. Now a new Team has begun writing new sets again under the auspices of a professional Lead Writer. Every lesson was either rewritten or replaced using our new higher standard of creativity and teacher-helpful detail. We introduce new resources and new ways to teach in each workshop. We made sure lessons appeal to our older kids in grades 3-5, with plenty of "age appropriate" adaptations for younger students, and those with shorter class times. We added more instructions, "say this," and explanations for those teachers who need extra description. We re-wrote all the Bible Backgrounds with classroom-ready, teacher-friendly language and insights. Less "academic," they are more understandable to the average volunteer and more inspirational. We added more "in-lesson" explanations of key points and reasons why we are doing things a certain way. We made sure each lesson follows the set's teaching objectives, and that activities strongly relate to the teaching points and aren't just tangential. We added extra special lessons in each Lesson Set for those who want a "bigger splash." We certainly appreciate the work of the original team which involved over 25 different writers (not working at the same time). But one of the philosophies of the Rotation Model and strengths of being a web-enabled ministry is that WE CAN and SHOULD CHANGE and IMPROVE. Moving forward, the Team process and content will be more closely guided by our Lead Writer whose work is supervised by our all-volunteer Board of Directors. The cost of this Lead Writer's time and talent is one of the expenses our generous Supporting Members make possible. The Cross, to be completed by Dec 1, 2018. Want to join the WT? Our new Team process provides training and support to every writer. You'll not only enjoy being part of a team of volunteer writers working together, you'll learn how we choose a story, learn how we decide to approach it with kids, and brainstorm with us to come up with the creative lesson activities and plans that are the hallmark of the Writing Team's sets. No prior Rotation or writing experience is needed. Just bring a love for teaching kids, some creative juices, and the ability to work with a team. Email Neil MacQueen at webmaster.rotation@gmail.com for details.